The Deep Learning in Healthcare Summit is returning for the 3rd annual event in London! Hear from industry leaders, academics, researchers and innovative startups working to advance deep learning technology in Healthcare. Focusing on topics such as medical imaging, speech recognition, diagnostics, pattern recognition and how these are applied within Healthcare. The summit is a great way to discover the latest insights, evaluate your position within the field and how the impacts can affect yourself and your work and network with people working in the field to create opportunities to collaborate and broaden your knowledge. 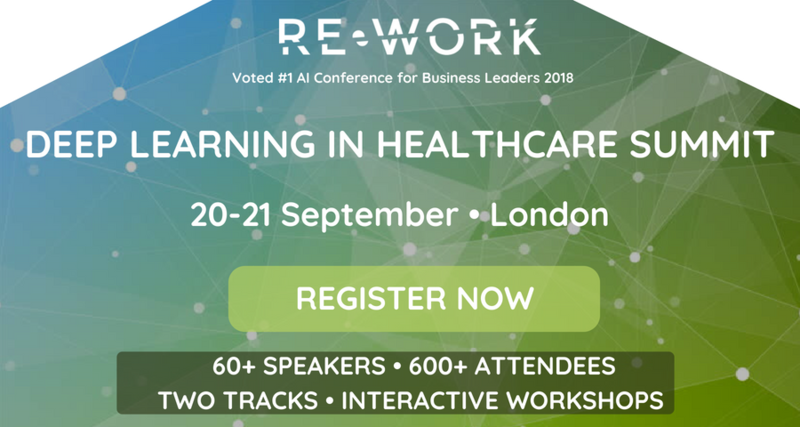 RE•WORK was voted #1 Best Artificial Intelligence Conference for Business Leaders in 2018! Being a media partner of the event, eHealth HUB is delighted to recommend to use the discount code as following. *this can be added to tickets when at checkout or alternatively you can use this link and it will auto apply the discount code.